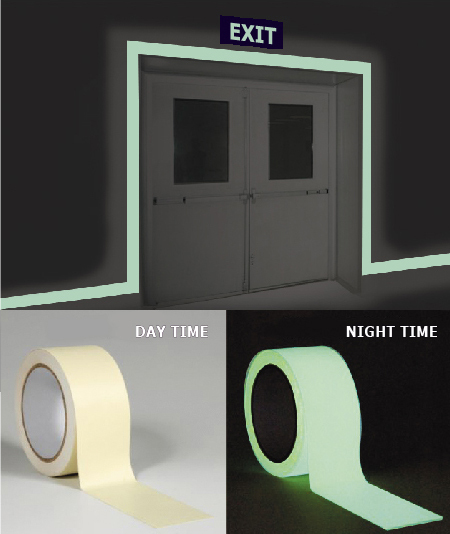 Glow-in-the-dark Tape will glow in total darkness after exposure to any type of light, but sunlight, halogen, xenon, & fluorescent lights work best – it is fully charge within 30 minutes. Glows brightest the first 30 minutes after activation has ceased, and will remain clearly visible in a totally dark room to the night adapted eye for 6 hours (#20306), 10 hours (#20310), and 24 hours (#20324) respectively. It’s designed for critical equipment controls, light switch covers, exit and directional signage – especially for escape routes and stairways. These tapes can also be die-cut and kiss-cut using steel rule dies.